Bro can connect with network devices like, for example, switches or soft- and hardware firewalls using the NetControl framework. The NetControl framework provides a flexible, unified interface for active response and hides the complexity of heterogeneous network equipment behind a simple task-oriented API, which is easily usable via Bro scripts. This document gives an overview of how to use the NetControl framework in different scenarios; to get a better understanding of how it can be used in practice, it might be worthwhile to take a look at the unit tests. NetControl architecture (click to enlarge). 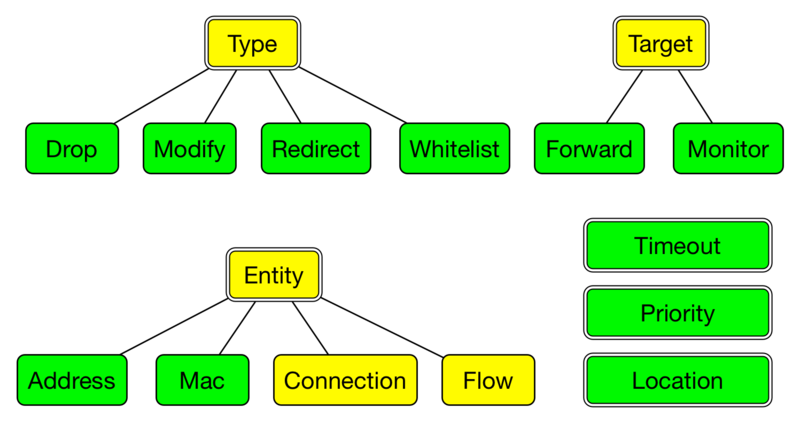 The basic architecture of the NetControl framework is shown in the figure above. Conceptually, the NetControl framework sits between the user provided scripts (which use the Bro event engine) and the network device (which can either be a hardware or software device), that is used to implement the commands. The NetControl framework supports a number of high-level calls, like the NetControl::drop_address function, or a lower level rule syntax. After a rule has been added to the NetControl framework, NetControl sends the rule to one or several of its backends. Each backend is responsible to communicate with a single hard- or software device. The NetControl framework tracks rules throughout their entire lifecycle and reports the status (like success, failure and timeouts) back to the user scripts. The backends are implemented as Bro scripts using a plugin based API; an example for this is base/frameworks/netcontrol/plugins/broker.bro. This document will show how to write plugins in NetControl Plugins. In this section, we will introduce the high level NetControl API. As mentioned above, NetControl uses backends to communicate with the external devices that will implement the rules. You will need at least one active backend before you can use NetControl. For our examples, we will just use the debug plugin to create a backend. This plugin outputs all actions that are taken to the standard output. After at least one backend has been added to the NetControl framework, the framework can be used and will send added rules to the added backend. The NetControl framework contains several high level functions that allow users to drop connections of certain addresses and networks, shunt network traffic, etc. The following table shows and describes all of the currently available high-level functions. NetControl::drop_address Calling this function causes NetControl to block all packets involving an IP address from being forwarded. NetControl::drop_connection Calling this function stops all packets of a specific connection (identified by its 5-tuple) from being forwarded. NetControl::drop_address_catch_release Calling this function causes all packets of a specific source IP to be blocked. This function uses catch-and-release functionality and the IP address is only dropped for a short amount of time to conserve rule space in the network hardware. It is immediately re-dropped when it is seen again in traffic. See Catch and Release for more information. NetControl::shunt_flow Calling this function causes NetControl to stop forwarding a uni-directional flow of packets to Bro. This allows Bro to conserve resources by shunting flows that have been identified as being benign. NetControl::redirect_flow Calling this function causes NetControl to redirect a uni-directional flow to another port of the networking hardware. NetControl::quarantine_host Calling this function allows Bro to quarantine a host by sending DNS traffic to a host with a special DNS server, which resolves all queries as pointing to itself. The quarantined host is only allowed between the special server, which will serve a warning message detailing the next steps for the user. NetControl::whitelist_address Calling this function causes NetControl to push a whitelist entry for an IP address to the networking hardware. NetControl::whitelist_subnet Calling this function causes NetControl to push a whitelist entry for a subnet to the networking hardware. In our case, netcontrol.log contains several NetControl::MESSAGE entries, which show that the debug plugin has been initialized and added. Afterwards, there are two NetControl::RULE entries; the first shows that the addition of a rule has been requested (state is NetControl::REQUESTED). The following line shows that the rule was successfully added (the state is NetControl::SUCCEEDED). The remainder of the log line gives more information about the added rule, which in our case applies to a specific 5-tuple. As already mentioned in the last section, in addition to the high-level API, the NetControl framework also supports a Rule based API which allows greater flexibility while adding rules. Actually, all the high-level functions are implemented using this lower-level rule API; the high-level functions simply convert their arguments into the lower-level rules and then add the rules directly to the NetControl framework (by calling NetControl::add_rule). NetControl Rule overview (click to enlarge). The types that are used to make up a rule are defined in base/frameworks/netcontrol/types.bro. Rules are defined as a NetControl::Rule record. Rules have a type, which specifies what kind of action is taken. The possible actions are to drop packets, to modify them, to redirect or to whitelist them. The target of a rule specifies if the rule is applied in the forward path, and affects packets as they are forwarded through the network, or if it affects the monitor path and only affects the packets that are sent to Bro, but not the packets that traverse the network. The entity specifies the address, connection, etc. that the rule applies to. In addition, each rule has a timeout (which can be left empty), a priority (with higher priority rules overriding lower priority rules). Furthermore, a location string with more text information about each rule can be provided. There are a couple more fields that are only needed for some rule types. For example, when you insert a redirect rule, you have to specify the port that packets should be redirected to. All these fields are shown in the NetControl::Rule documentation. To give an example on how to construct your own rule, we are going to write our own version of the NetControl::drop_connection function. The only difference between our function and the one provided by NetControl is the fact that the NetControl function has additional functionality, e.g. for logging. The last example shows that NetControl::add_rule returns a string identifier that is unique for each rule (uniqueness is not preserved across restarts of Bro). This rule id can be used to later remove rules manually using NetControl::remove_rule. Similar to NetControl::add_rule, all the high-level functions also return their rule IDs, which can be removed in the same way. The NetControl framework offers a number of different ways to interact with rules. Before a rule is applied by the framework, a number of different hooks allow you to either modify or discard rules before they are added. Furthermore, a number of events can be used to track the lifecycle of a rule while it is being managed by the NetControl framework. It is also possible to query and access the current set of active rules. The hook NetControl::rule_policy provides the mechanism for modifying or discarding a rule before it is sent onwards to the backends. Hooks can be thought of as multi-bodied functions and using them looks very similar to handling events. In contrast to events, they are processed immediately. Like events, hooks can have priorities to sort the order in which they are applied. Hooks can use the break keyword to show that processing should be aborted; if any NetControl::rule_policy hook uses break, the rule will be discarded before further processing. In addition to the hooks, the NetControl framework offers a variety of events that are raised by the framework to allow users to track rules, as well as the state of the framework. We already encountered and used one event of the NetControl framework, NetControl::init, which is used to initialize the framework. After the framework has finished initialization and will start accepting rules, the NetControl::init_done event will be raised. NetControl::rule_new Signals that a new rule is created by the NetControl framework due to NetControl::add_rule. At this point, the rule has not yet been added to any backend. NetControl::rule_added Signals that a new rule has successfully been added by a backend. NetControl::rule_exists This event is raised instead of NetControl::rule_added when a backend reports that a rule was already existing. NetControl::rule_timeout Signals that a rule timeout was reached. If the hardware does not support automatic timeouts, the NetControl framework will automatically call NetControl::remove_rule. NetControl::rule_removed Signals that a new rule has successfully been removed a backend. NetControl::rule_destroyed This event is the pendant to NetControl::rule_added, and reports that a rule is no longer being tracked by the NetControl framework. This happens, for example, when a rule was removed from all backends. NetControl::rule_error This event is raised whenever an error occurs during any rule operation. The NetControl framework provides two functions for finding currently active rules: NetControl::find_rules_addr finds all rules that affect a certain IP address and NetControl::find_rules_subnet finds all rules that affect a specified subnet. Consider, for example, the case where a Bro instance monitors the traffic at the border, before any firewall or switch rules were applied. In this case, Bro will still be able to see connection attempts of already blocked IP addresses. In this case, NetControl::find_rules_addr could be used to check if an address already was blocked in the past. Here is a simple example, which uses a trace that contains two connections from the same IP address. After the first connection, the script recognizes that the address is already blocked in the second connection. Notice that the functions return vectors because it is possible that several rules exist simultaneously that affect one IP; either there could be rules with different priorities, or rules for the subnet that an IP address is part of. We already mentioned earlier that in addition to the NetControl::drop_connection and NetControl::drop_address functions, which drop a connection or address for a specified amount of time, NetControl also comes with a blocking function that uses an approach called catch and release. Catch and release is a blocking scheme that conserves valuable rule space in your hardware. Instead of using long-lasting blocks, catch and release first only installs blocks for a short amount of time (typically a few minutes). After these minutes pass, the block is lifted, but the IP address is added to a watchlist and the IP address will immediately be re-blocked again (for a longer amount of time), if it is seen reappearing in any traffic, no matter if the new traffic triggers any alert or not. This makes catch and release blocks similar to normal, longer duration blocks, while only requiring a small amount of space for the currently active rules. IP addresses that only are seen once for a short time are only blocked for a few minutes, monitored for a while and then forgotten. IP addresses that keep appearing will get re-blocked for longer amounts of time. In contrast to the other high-level functions that we documented so far, the catch and release functionality is much more complex and adds a number of different specialized functions to NetControl. The documentation for catch and release is contained in the file base/frameworks/netcontrol/catch-and-release.bro. Note that you do not have to provide the block time for catch and release; instead, catch and release uses the time intervals specified in NetControl::catch_release_intervals (by default 10 minutes, 1 hour, 24 hours, 7 days). That means when an address is first blocked, it is blocked for 10 minutes and monitored for 1 hour. If the address reappears after the first 10 minutes, it is blocked for 1 hour and then monitored for 24 hours, etc. In addition to the blocking function, catch and release comes with the NetControl::get_catch_release_info function to check if an address is already blocked by catch and release (and get information about the block). The NetControl::unblock_address_catch_release function can be used to unblock addresses from catch and release. Since catch and release does its own connection tracking in addition to the tracking used by the NetControl framework, it is not sufficient to remove rules that were added by catch and release using NetControl::remove_rule. You have to use NetControl::unblock_address_catch_release in this case. In the API part of the documentation, we exclusively used the debug plugin, which simply outputs its actions to the screen. In addition to this debugging plugin, Bro ships with a small number of plugins that can be used to interface the NetControl framework with your networking hard- and software. OpenFlow plugin This is the most fully featured plugin which allows the NetControl framework to be interfaced with OpenFlow switches. The source of this plugin is contained in base/frameworks/netcontrol/plugins/openflow.bro. Broker plugin This plugin provides a generic way to send NetControl commands using the new Bro communication library (Broker). External programs can receive the rules and take action; we provide an example script that calls command-line programs triggered by NetControl. The source of this plugin is contained in base/frameworks/netcontrol/plugins/broker.bro. acld plugin This plugin adds support for the acld daemon, which can interface with several switches and routers. The current version of acld is available from the LBL ftp server. The source of this plugin is contained in base/frameworks/netcontrol/plugins/acld.bro. PacketFilter plugin This plugin uses the Bro process-level packet filter (see install_src_net_filter and install_dst_net_filter). Since the functionality of the PacketFilter is limited, this plugin is mostly for demonstration purposes. The source of this plugin is contained in base/frameworks/netcontrol/plugins/packetfilter.bro. Debug plugin The debug plugin simply outputs its action to the standard output. The source of this plugin is contained in base/frameworks/netcontrol/plugins/debug.bro. In the API reference part of this document, we already used the debug plugin. To use the plugin, we first had to instantiate it by calling NetControl::create_debug and then add it to NetControl by calling NetControl::activate. As we already hinted before, NetControl supports having several plugins that are active at the same time. The second argument to the NetControl::activate function is the priority of the backend that was just added. Each rule is sent to all plugins in order, from highest priority to lowest priority. The backend can then choose if it accepts the rule and pushes it out to the hardware that it manages. Or, it can opt to reject the rule. In this case, the NetControl framework will try to apply the rule to the backend with the next lower priority. If no backend accepts a rule, the rule insertion is marked as failed. The choice if a rule is accepted or rejected stays completely with each plugin. The debug plugin we used so far just accepts all rules. However, for other plugins you can specify what rules they will accept. Consider, for example, a network with two OpenFlow switches. The first switch forwards packets from the network to the external world, the second switch sits in front of your Bro cluster to provide packet shunting. In this case, you can add two OpenFlow backends to NetControl. When you create the instances using NetControl::create_openflow, you set the monitor and forward attributes of the configuration in NetControl::OfConfig appropriately. Afterwards, one of the backends will only accept rules for the monitor path; the other backend will only accept rules for the forward path. Commonly, plugins also support predicate functions, that allow the user to specify restrictions on the rules that they will accept. This can for example be used if you have a network where certain switches are responsible for specified subnets. The predicate can examine the subnet of the rule and only accept the rule if the rule matches the subnet that the specific switch is responsible for. To give an example, the following script adds two backends to NetControl. One backend is the NetControl debug backend, which just outputs the rules to the console. The second backend is an OpenFlow backend, which uses the OpenFlow debug mode that outputs the openflow rules to openflow.log. The OpenFlow backend uses a predicate function to only accept rules with a source address in the 192.168.17.0/24 network; all other rules will be passed on to the debug plugin. We manually block a few addresses in the NetControl::init_done event to verify the correct functionality. You might have asked yourself what happens when you add two or more with the same priority. In this case, the rule is sent to all the backends simultaneously. This can be useful, for example when you have redundant switches that should keep the same rule state. Now that we know which plugins exist, and how they can be added to NetControl, it is time to discuss how we can interface Bro with actual hardware. The typical way to accomplish this is to use the Bro communication library (Broker), which can be used to exchange Bro events with external programs and scripts. The NetControl plugins can use Broker to send events to external programs, which can then take action depending on these events. The following figure shows this architecture with the example of the OpenFlow plugin. The OpenFlow plugin uses Broker to send events to an external Python script, which uses the Ryu SDN controller to communicate with the Switch. NetControl and OpenFlow architecture (click to enlarge). The Python scripts that are used to interface with the available NetControl plugins are contained in the zeek-netcontrol repository (github link). The repository contains scripts for the OpenFlow as well as the acld plugin. Furthermore, it contains a script for the broker plugin which can be used to call configureable command-line programs when used with the broker plugin. The repository also contains documentation on how to install these connectors. The netcontrol directory contains an API that allows you to write your own connectors to the broker plugin. Note that the API of the Broker communication library is not finalized yet. You might have to rewrite any scripts for use in future Bro versions. In addition to using the plugins that are part of NetControl, you can write your own plugins to interface with hard- or software that we currently do not support out of the box. Creating your own plugin is easy; besides a bit of boilerplate, you only need to create two functions: one that is called when a rule is added, and one that is called when a rule is removed. The following script creates a minimal plugin that just outputs a rule when it is added or removed. Note that you have to raise the NetControl::rule_added and NetControl::rule_removed events in your plugin to let NetControl know when a rule was added and removed successfully. If you want to write your own plugins, it will be worthwhile to look at the plugins that ship with the NetControl framework to see how they define the predicates and interact with Broker.